Summer in Saskatoon is here! Let's celebrate with a play pack give-away from PotashCorp Playland at Kinsmen Park. My children's favourite of the three rides continues to be the lovely vintage carousel. Significant time is spent figuring out which of the beautifully refurbished animals they will choose. My personal fave is the 63-feet-high, lemon-yellow ferris wheel. The enduring kid inside me can't help but squeal as we rise above the trees for spectacular open-air views of the park, river, University Bridge and downtown Saskatoon. Of course, we can never leave without a ride on the fire-engine-red Canpotex train and some time spent in the free play area. 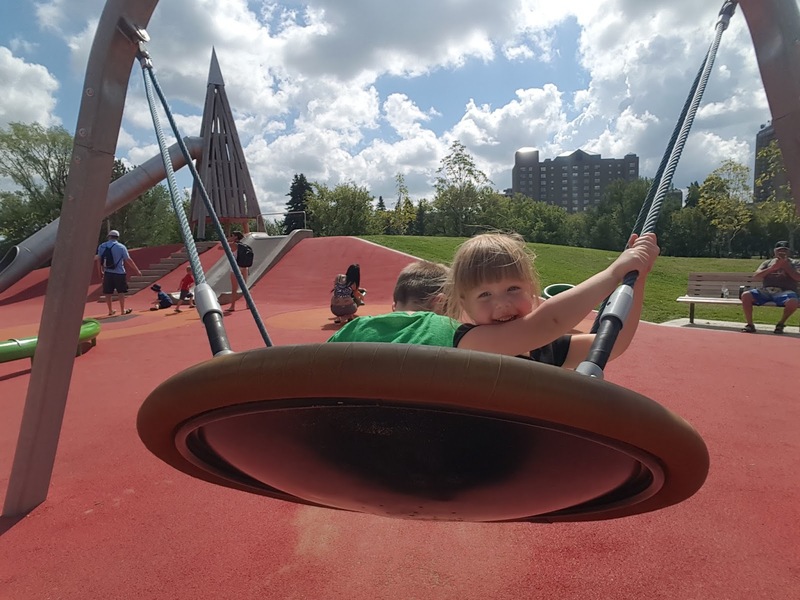 The PotashCorp Playland at Kinsmen Park is a perfect place to celebrate summer in Saskatoon! Enter to win a 12-ticket play pack by sharing ways your family likes to celebrate summer in Saskatoon in the comments below and/or via @saskmomdotcom on Facebook. A winner will be chosen on June 28. We love to explore the city we live in by visiting the forestry farm, WDM, Kinsmen Park, and do some geocaching! We love checking out all the spray pads and playgrounds! Going for walks by the river is fun. We also enjoy the Forestry Farm and the splash parks among many other things! Saskatoon is great in Summer! Bike rides and checking out various parks and spray pads! Living in a multicultural city such as Saskatoon, we love to take in all the festivals and events that happen right here in our city. Events such as the National Aboriginal day or going to Eid bazaar is much fun for us as we learn about other cultures and get to know the folks in Saskatoon. My family enjoys going to the lake, biking outside, and playground time in the summer. My busy 2 year old got to experience Kinsmen park for the first time last year and loved it, too! We love the beach. Any beach. With shade, because some of us are gingers. We like to go play at the different parks, padding pools, and spray parks around Saskatoon! We love the forestry farm! We go there regularily! We love to walk along the river, go to various parks and spray pads, and try to get to as many festivals as we can! We like to take walks by the river. Enjoy the library summer reading club. We like to camp in the backyard, go to the beach, go to the spray parks and paddling pools! Or just relax in the backyard!